The LNG market in 2016 saw a flurry of new Australian and US production start-up but plant outages stemmed the flow of cargoes. Spot prices fell on weak East Asian demand for much of the year but new buyers came into the market. Future investment in export production was in major doubt as floating storage regasification units (FSRUs) took centre stage for importers. Weaker East Asian demand continued for much of the year but Middle East and Indian LNG consumption blossomed. Despite competition from the start of US LNG exports and additional Australian production, European reloads in 2016 still played an important role for traders in managing positions into the Middle East. 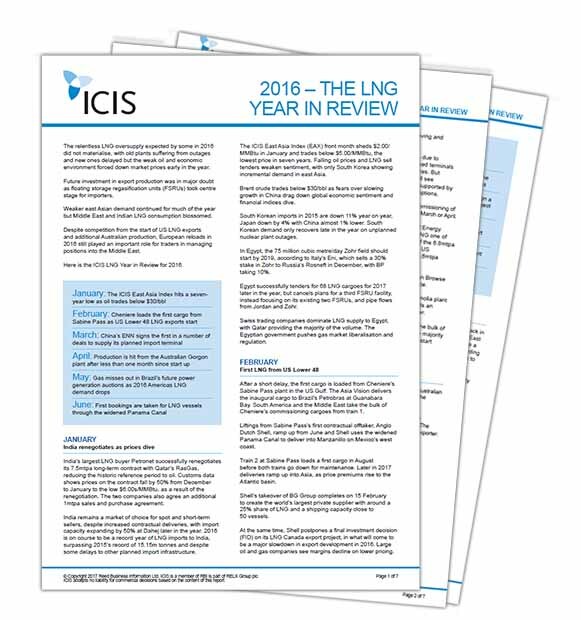 In this white paper, ICIS offers a thorough review of all the key global LNG events and changes over 2016.